» Will EV battery segment take the ‘lead’? Sunil Duggal is also President of the Federation of Indian Mineral Industries. He holds positions in the International Zinc Association, FICCI and the Indian Lead Zinc Development Association. There are many metals such as lithium, cobalt, nickel, graphite and manganese competing with lead and zinc to be used in e-vehicle batteries. Where does lead fit in this equation? Lead-acid batteries are used in e-rickshaws, e-bikes, etc. It is slightly different in electric cars. In e-cars, the auxiliary battery is lead-acid-based, while the motive power battery has to be from a newer technology based on metals such as lithium and nickel, as they have better energy density (energy-to-weight ratio). But these technologies are still in the nascent stage when it comes to commercial viability. Also, lead-acid batteries have the ability to overcome its weakness (low energy density) with its cost competitiveness, safety, availability of raw materials and recyclability. Immense technological research is going in improving lead-acid batteries. We believe the demand for lead acid will continue to be strong. The developments in Li-ion batteries is recent, but lead-acid batteries have been here for many decades. Considering the cost and various technical parameters, lead-acid batteries will continue to be the preferred energy storage device, and their demand is not expected to fall. The global reserves of lithium are quite limited and restricted to a few countries in South America. 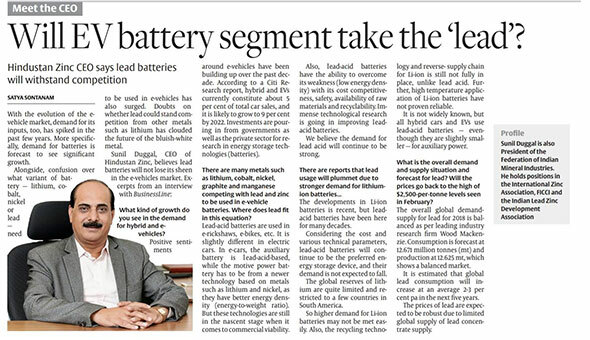 So higher demand for Li-ion batteries may not be met easily. Also, the recycling technology and reverse- supply chain for Li-ion is still not fully in place, unlike lead acid. Further, high temperature application of Li-ion batteries have not proven reliable. It is not widely known, but all hybrid cars and EVs use lead-acid batteries — even though they are slightly smaller — for auxiliary power. What is the overall demand and supply situation and forecast for lead? Will the prices go back to the high of $2,500-per-tonne levels seen in February? The overall global demand-supply for lead for 2018 is balanced as per leading industry research firm Wood Mackenzie. Consumption is forecast at 12.671 million tonnes (mt) and production at 12.625 mt, which shows a balanced market. It is estimated that global lead consumption will increase at an average 2-3 per cent pa in the next five years. The prices of lead are expected to be robust due to limited global supply of lead concentrate supply.